Pink Milk: Where Did You Get That Hat? It's such a beautiful day here. I do hope the sun is shining where you are. It was easy-peasy to make and pretty quick too. I used this pattern (which is free to download) but stopped at 35 rows and added a simple scalloped edge. Until I decide how best to embellish it, I've attached a couple of little homemade brooches. I'll definitely be making a few in different colours. Oh I do ♥ a hat, don't you? I think he knows I'm a teeny bit addicted to them at the moment!! D's not so keen, he thinks 'vintage' means 'somebody has died on me'!!! 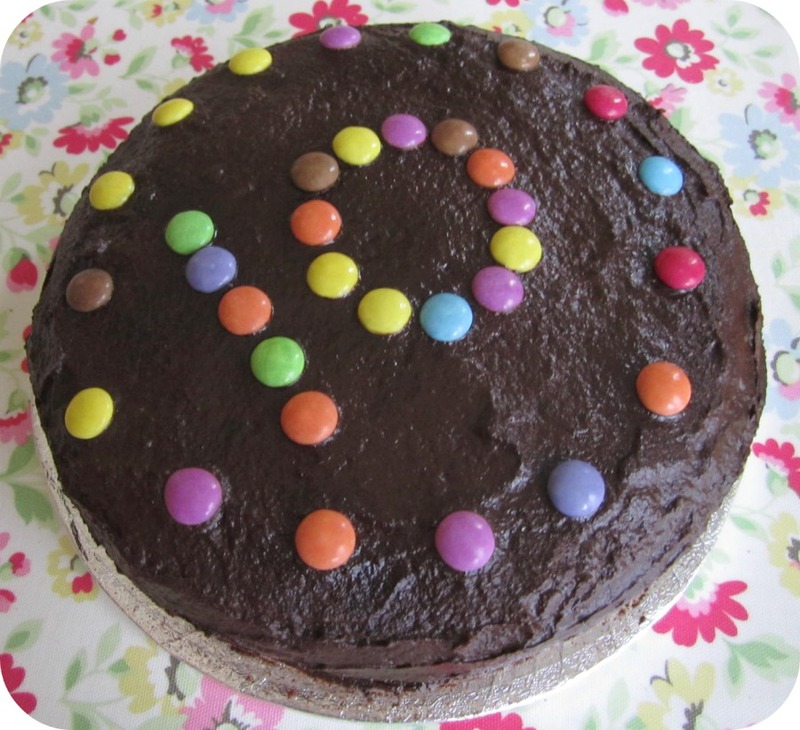 Talking of D, he actually ASKED me to put a photo of blondie daughter's birthday cake on my blog! You see, he made it! He's been completely glued to The Great British Bake Off and mentions Mary Berry, oh, at least three times a day. I tell you, if she were a few years younger, I'd definitely have a touch of the green-eyed monster! As you know, I'm really not into cakes at all, so out of desperation D started baking every Saturday morning. He bans us all from the kitchen, puts the Foo Fighters on maximum volume, bakes his little socks off and loves every minute of it! There have been honey flapjacks, victoria sponges and I think tomorrow's project is a lemon drizzle cake. Anyway, it's half term next week so we have lots of pottering planned! Have a simply lovely weekend. PS. Anyone else think Blogger is being totally poo at the moment? Love the hat.....i've been after a nice hat pattern ready for winter. The yarn looks dreamy. It's always such a buzz when you open a packet of yarn up! Loving the pillowcases too! I picked up a couple this morning from the charity shop and just drying on the line as I type! Mr H feels exactly as D does about them! Love the cake too and the fact that D does weekend baking! How cool! I loved watching The Great British Bake Off. Can't see Mr H getting that enthusiastic about making cakes.....a good mexican is more his area of expertise! The sun is shining here too and it's just lovely! Love the hat! I'm using light grey and white Sublime to knit a christmas jumper for Miss Peach Pudding, I'll put a photo on when it's done. It's gorgeous to work with. Very impressed with the cake! I love hats too. 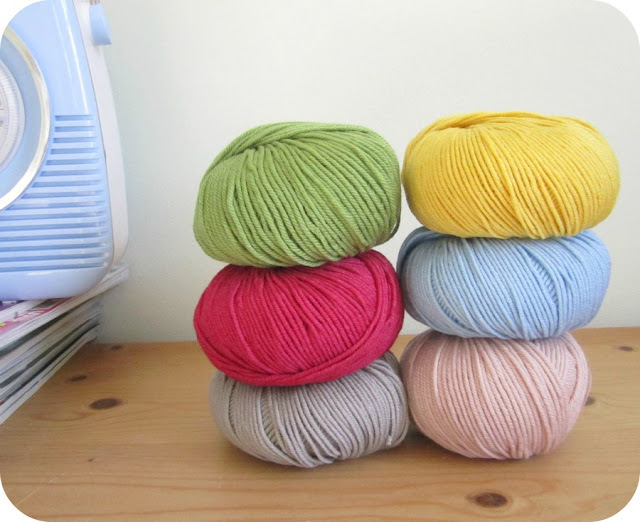 Hey, I love Sublime yarn, such pretty colours. I'm going to have to make one of those hats. Wish my Hubby baked. I think he's only ever made pasta! Love your hat and that yarn looks yummy...colours are sooo pretty. I too am impressed with your mans baking . Blogger has been pants for me too. I've been unable to comment for ages and I'm just hoping it doesn't wipe this message. Hey you! Are your blondies giving you that look of 'so this is what it's like to have yummy home baking'? heehee. I'm remembering your baking disaster you blogged about. If there's any of that lemon drizzle cake left send it my way! I love the hat, it's so pretty and the little brooches look cute too. And what a gorgeous cake!! Very impressive of D to be baking such delicious treats for you all! Lush hat, mush!!! Will have a glance at the pattern but what normally happens is I read it, go "eeek I can't do this" and then lose interest!!!! Going to try not to do that!!! You are lucky to have D in your household. Mine rarely cooks cos he is rarely there, but when he does go to the hassle of cooking, he does push the boat out. Just not cakes or biscuits (darn). Hello! 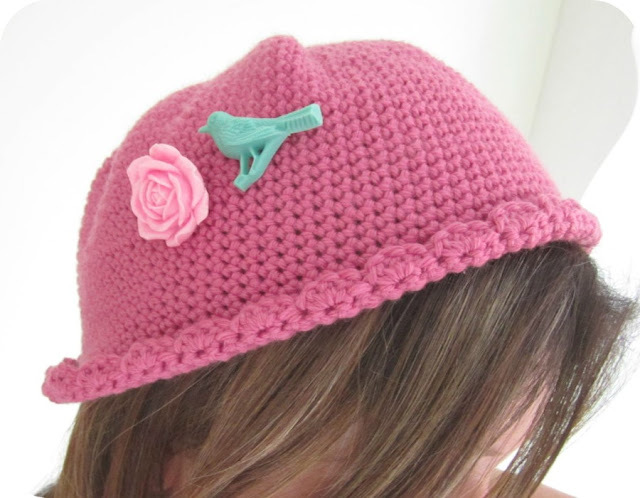 Lovely hat and I LOVE the brooches too, especially the bird. So nice and a divine colour. Gorgeous. D's cake looks delicious and had to laugh at Mary Berry being your rival! Andrew keeps threatening to make a cake for me, he's desperate to have a go but I just don't like the thought of him touching 'my' favourite mixing bowls and baking paraphernalia... control freak, moi?! ha! Loving your postman - almost exactly the same as my postmistress... she's been bringing me a few vintage pillowcases and some lovely Debbie Bliss yarn. Aren't they kind?! Have a great half term week. LOVE that your man is enjoying baking. Such a fab cake. Love the hat, the colour is very pretty. That did make me smile when you said how D feels about the pillowcases..haha..men just don't understand these things..! Hello, i have just found your blog courtesy of My Rose Valley and just wanted to say what a delightful hat. I have just made a similar one for my little girl but i will have to do one like yours for myself. I just need to find the time. Enjoy your weekend. Oh what a sweet hat, the colour is gorgeous. Can I please have your postman? Your little deliveries are just the knid I want! Lovely blog, so pleased to have found you. Your hat is ace. I feel it is time to get to grips with crochet. I am DETERMINED I tell you! Gorgeous hat! I am loving the pillow slip fabrics, and as for the cake - yum yum! All in all, a hat trick of fabulousness! How fantastic is your man?! Loverly hat. Yes a complimenting scarf is needed now I think. Gorgeous yarn. I think I havecthat pinky colour, if that's a sublime one. I have a shawl on my to do list that I'm going to knit in it. Wow - what a super fab hat and the chocolate 'gosh' now I'me coveting your cake. p.s was being pants but seems to have settled for me this week!...but i did loose a few posts last week ;0( and they havent re-appeared! It was so kind of you to drop by - I thought everyone would have forgotten me it was such a long time ago! It really is lovely to be back. Just happened upon your blog by accident. Must come back later and read some more. Love the hat. Cake looks good. I have had loads of trouble with blogger on IPad. Oh, that cake looks sooo yummy... love chocolate--in any shape or form! 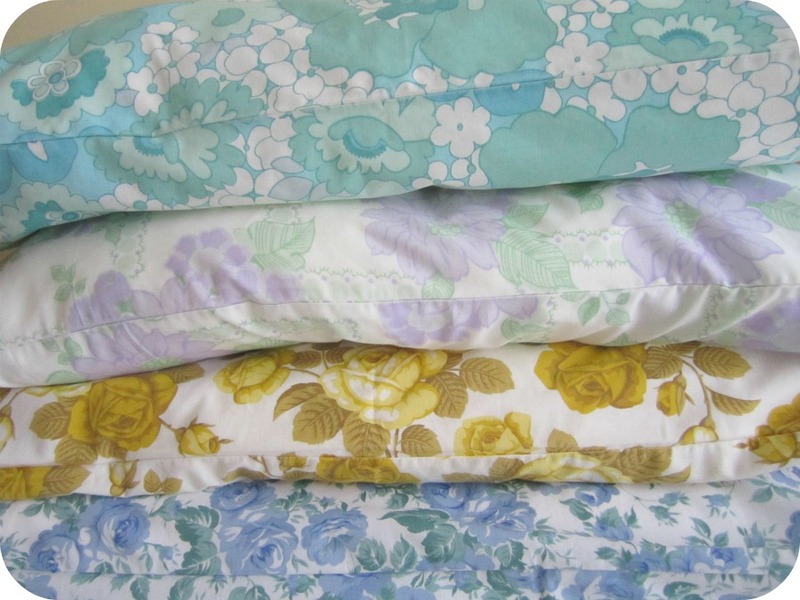 I've begun collecting vintage pillowcases also. I just love their wild-abandonment with color and pattern, and they are so sturdy! Oh dear - that green flowery pillowcase matches a duvet cover I have, and that was in my bedroom as a child - didn't know it was vintage! Does that make me vintage too?